Worked for all the major European designers and was a muse to many important designers. Became one of the highest paid--and one of the top 3 models of that time. Worked for all the New York designers and became a design consultant to some established fashion houses. 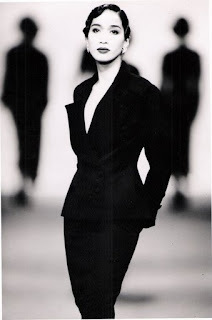 Did national & international campaigns for fashion houses and major department stores. Did calendars for Elite Modeling Agency and Shiseido Cosmetics. Featured in numerous Fashion Books: Mugler, Chanel, Scaasi, Valentino, Versace, YSL, Dior, Fashion Illustrations by Antonio, etc. Photographed by many of the top fashion photographers including Helmut Newton, Norman Parkinson, Sante D' Orazio, Peter Beard, David Seidner, Olivero Toscani, Arthur Elgort, Patrick Demarchelier, Peter Lindbergh, Skrebneski, Alex Chatelain and Paolo Roversi.